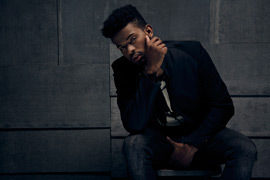 Glamoholic.com | Exclusive - Trevor Jackson: A Year of Growth! "American Crime" changed his life as an actor, he has grown a lot as a man and as a singer, in a year that he defines as a new chapter in his life. "I never compromise who I am or what I believe in". 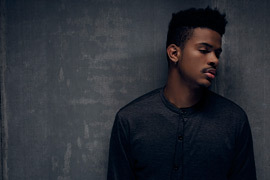 Trevor Jackson talks to Glamoholic about his latest album, making new music, upcoming film and expressing himself through fashion. Your latest album "In My Feelings" defined your musical identity. What do you think is your biggest achievement with his album? It's the closest to me out of all the music I've put out. 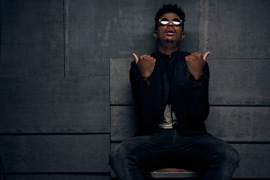 The closest to who Trevor Jackson is and the most honest. The music video for "Here I Come" touched a controversial story. What did inspire you to go there? People tend to hinder themselves, or block themselves because of the technicality of age. It's not about how long you've been alive but how much you've lived. "Like I Do" video was very powerful too! Do you think that being an actor is giving you the motivation to approach music videos from a different cinematic perspective? Absolutely, it plays a huge part. You've been on the road until recently. What was it like to meet your fans everywhere and perform the album for them? Amazing, I've never had any show before this where the audience knows every word to every song. It was pretty mind blowing and I'm so thankful to the fans. I worked so hard and, so many people told me I wouldn't be successful and now we have sold out shows. Are you working on new music already? When can we expect it? Hopefully I'll have some new stuff in August. I've had a few projects I've been filming, so I definitely want to get back to the music soon. What type of stories would you like to sing about in your next album? When I write I don't have particular thing in my head. It's just whatever I'm feeling. No matter what, I want to make things that are true and relatable that everyone has gone through. And I definitely want it to sound different from "In My Feelings." I want to constantly evolve. It hasn't been so long since our last interview, yet it feels like a lot has changed. Do you feel like the last couple of years brought a lot of new things to your life and career? American crime changed my life, in terms of acting. I've grown a lot musically! This year has really been a new chapter in my life and I've grown as a man. What is it like to grow up in the public's eye from your perspective? Do you ever think about it or do you just live your life the way you want to? I definitely think about it, whether it's posting snapchats, videos.. People trying to catch you being you is hard sometimes, but I never compromise who I am or what I believe in. I have to be cautious in what I put out there, but I will always represent me. Earlier this year we've seen you on "American Crime". How would you describe your whole experience on the show? Growth. That's my word of the year. I've grown a lot especially as an actor. The experience has inspired me to want to do more such as directing. Watching and studying how the whole cast works, you just pick up on things. We will see you next on "Juveniles". What can you tell us about this film? The film is pretty dark and a lot of blood! The cast is so talented and the movie is dope. Definitely a different take on movies, amazing for sure. What did attract you the most to play "Trent"? Trent is the comic relief of the film and since the film is so dark, he lightens up the mood. I feel like every movie needs someone like that. Being so good at both singing and acting gives a lot to your fans to enjoy. Does this make you feel double the responsibility to keep doing better? Whether I'm doing one or two or four things, I will always want to do better. I'll never be satisfied in terms of working or skill level. I can always be better. Having both gets difficult sometimes, as people can't always tell what's real. Do you think that being 19 years old makes you more engaged on social media and understand better how to maintain that relationship with your fans? I'm actually not the greatest in technology! I'm just so focused on life and enjoying it and that's something that I want to spread to young people. Live in the moment and don't care about how many likes you get. You've definitely found your own fashion style in the last few years. Do you enjoy this aspect of expressing yourself through your image? Yeah, I express myself though fashion the same way as I do through music – it's whatever I feel that day! I feel like some people want to say if he wears clothing like this –he's this way, etc. I live in the moment and whatever I'm feeling, I'm honest with that. People shouldn't be afraid to figure themselves out. You've also been maintaining a healthy lifestyle, looking better than ever. How often do you work out? And do you have a goal body you want to reach? I don't eat as well as I like to, I don't know how my body stays in shape! I try to work out a bit before I go to sleep and a little right after I wake up. Is there any fitness tip you can share with us? I need a trainer! Get a trainer! Are you still enjoying the single life? I am. There's just a lot going on right now. I'm not really in the place to give all my attention to someone, which is what anyone deserves. My ability to understand people. I feel like I rarely judge. I just try to put myself in everyone's shoes and understand why they are the way they are. People need to understand and appreciate that everyone's different.